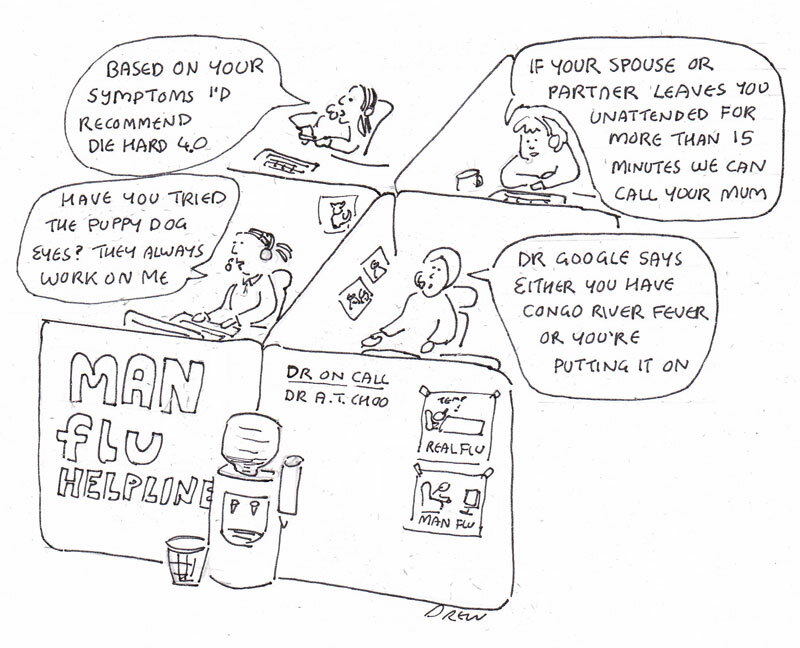 This is the cartoon entry for this week's caption compedition at the CCGB (Cartoon Club Great Britain) Forum. After week one's elation I faced the difficult second album problem of trying to beat my debut which I predictably didn't manage gaining 4 points and coming roughly 8th out of 15. The Forum is a mixture of pro and amateur cartoonists and you can tell the differences between my drawing and someone who does this for a living. So back to the drawing board for next week. 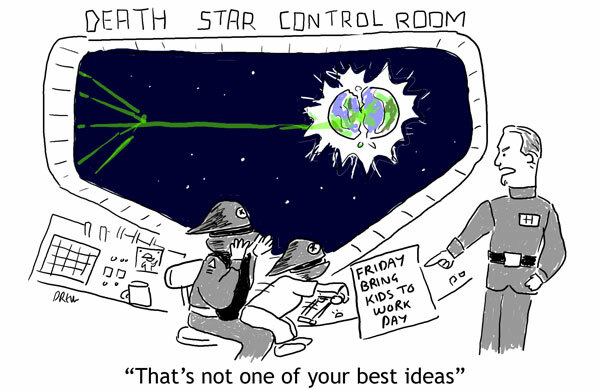 However as far as cliched Star Wars jokes go it isn't my best idea but neither is it my worst. Ps. This week's winner like Roger Kettle last week has some pedigree. You'll have seen Richard Skipworth on Hallmark and other cards. Since my caption compedition almost victory last weekend have spent the week thinking what to draw with the caption 'That's not one of your best ideas'. This was one of my ideas (perhaps not the best) inspired by my son's ability to reach places he shouldn't including climbing out his cot tonight. 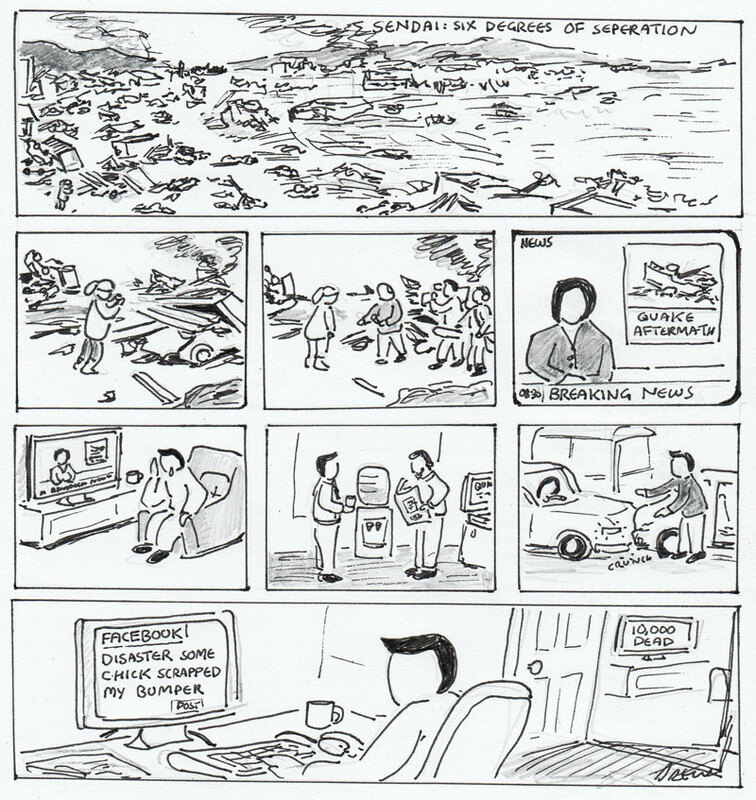 After the weekend's compedition excitement I come back to a cartoon I was working on pre-tsunami. Lent is about preparing the Christian for the Easter Holy Week and it's length of forty day mirrors the forty days in the desert where Jesus was tempted. The emphasis these days seems to be on giving something up but traditionally it included prayer, fasting, repentance, alms giving (charity) as well as self-denial. If Lent becomes just some sort of Holy Diet plan then like any form of dieting the thoughts will be on what is being given up rather than what good thing you are trying to achieve. 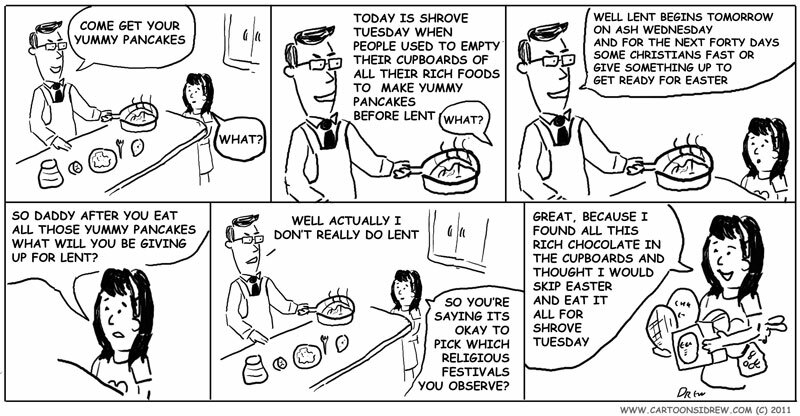 I salute those in the middle of Lent keep it up and focus not just on what you're giving up but on all the other good. 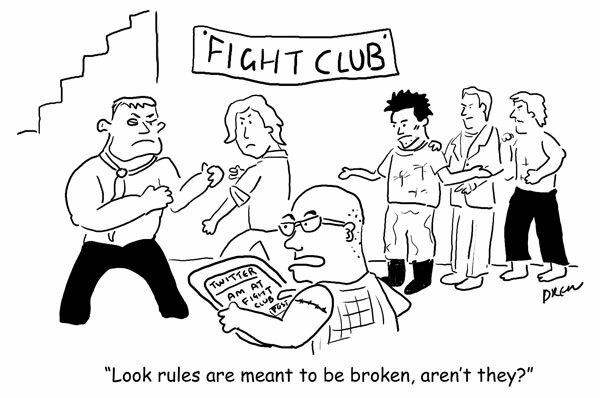 It is based on the notion that Fight Club's famous First Rule "The First Rule Of Fight Club Is We Don't Talk About Fight Club" wouldn't last five minutes in the age of Facebook, Twitter and everyone's personal lives being public. 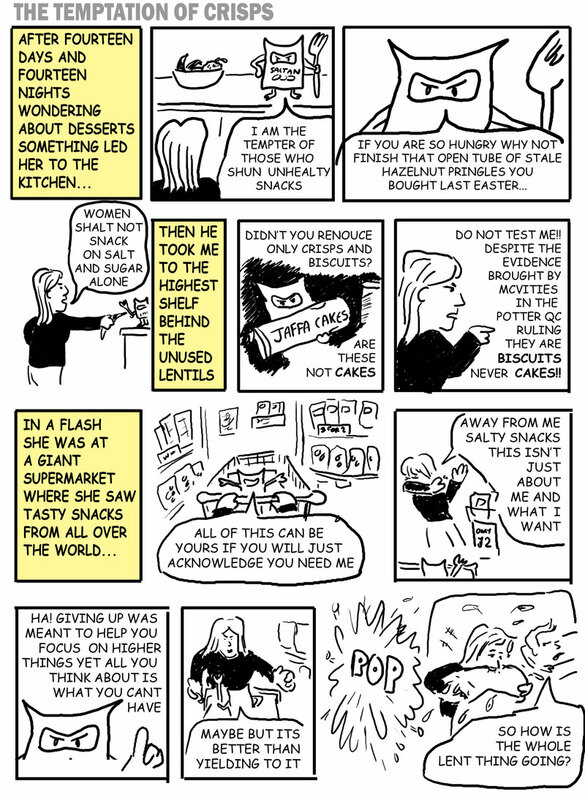 Of course explaining a cartoon sort of defeats the purpose along the lines of a Picture being a thousand words. The voting finished at 6pm and the result was out of 13 cartoons I was joint first with Roger Kettle but he won on some sort of Alternative Vote system where number of 2nd places count. Still I am chuffed given the quality of the field. You can view the thread of the compedition here. 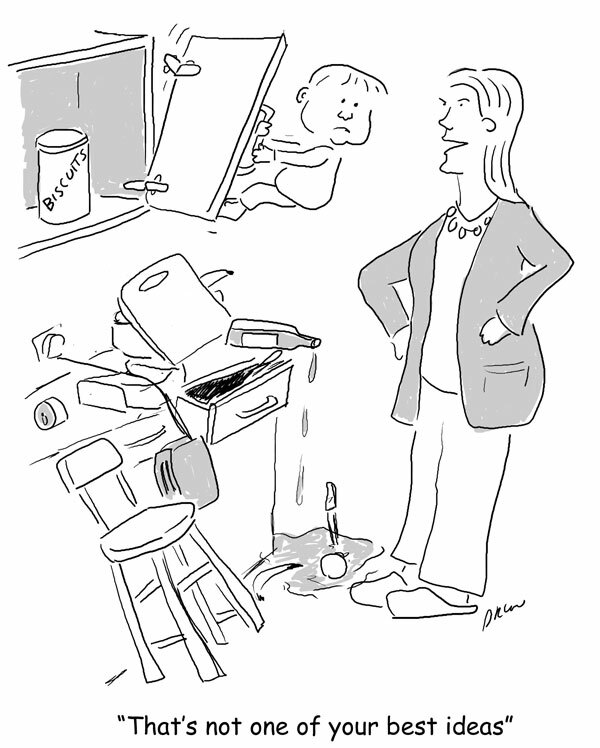 This is my first cartoon since the massive earthquake and Tsunami in Japan. As well as being glued to 24 hour news updates it risked being crass trying to make humour at such a time of great disaster (as a Malaysian newspaper who had to apologise for a rather insensitive Tsunami cartoon discovered). I even had a cartoon about Lent called 'Temptation of Crisps' half complete but couldn't move on from what I was reading and seeing so I drew this cartoon called 'Sendai: Six Degrees of Seperation' referring to Karinthky's theory that we are all connected to every other human on the planet by six others. I thought about what links me with the stoic suriviors on the other side of the world who have lost whole communities, have little in the way of supplies and help and have the threats of further aftershocks, tsunamis and nuclear reactors melting. By the time the news passes through 24-hour news and the Internet it may still have the power to shock and move but on the other side of the planet our lives go on and we are crass enough to call our minor ailments disasters. 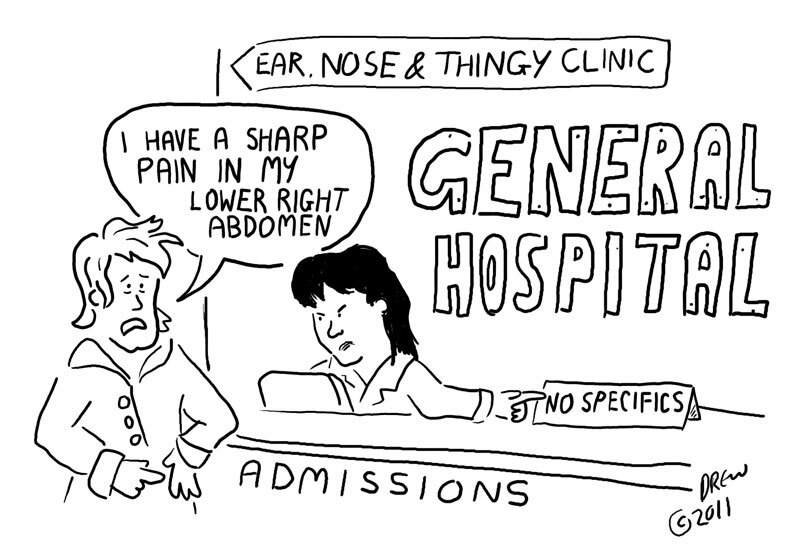 No prizes for guessing what sort of event inspired today's Bed themed cartoon hurriedly drawn before 8am this morning. 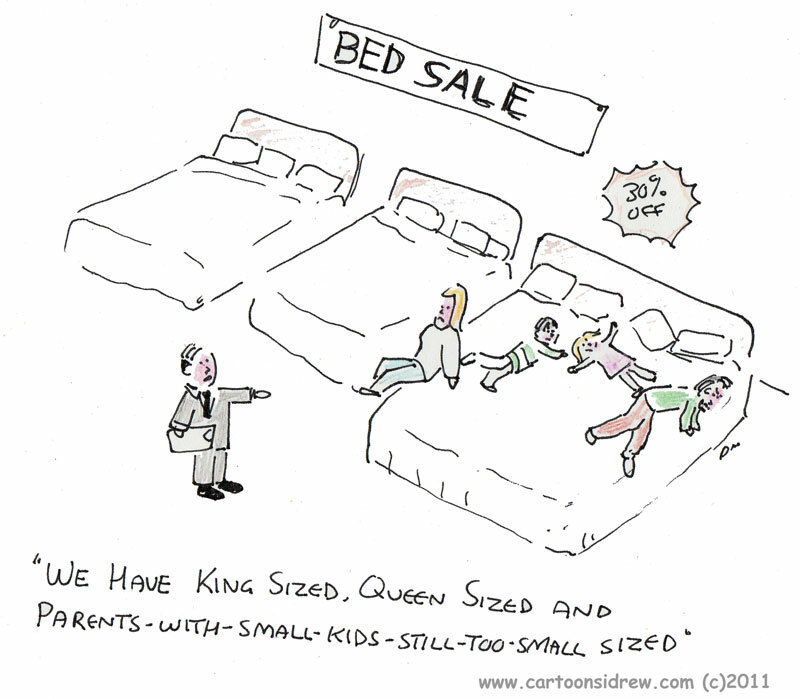 When sharing your bed children do not feel constrained by conventional methods of lying on the bed but experiment with various acute and even right angles 90 degrees perpendicular to the optimum fit everyone comfortably in your king sized bed position. My older child said my cartoon wasn't as pretty as her drawing and forced me to add some colour using pencils and crayons. 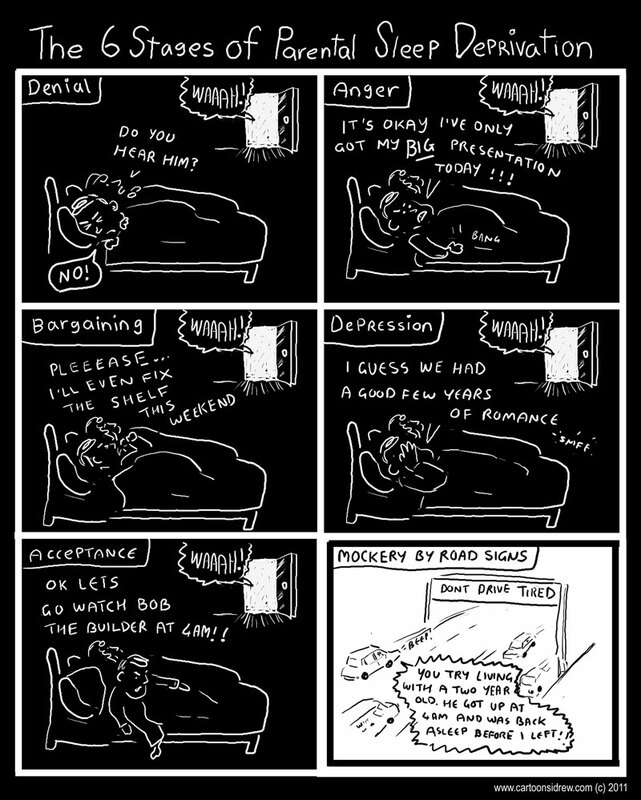 You will be able to track my success in getting decent sleep by the frequency of bed cartoons in the following weeks. 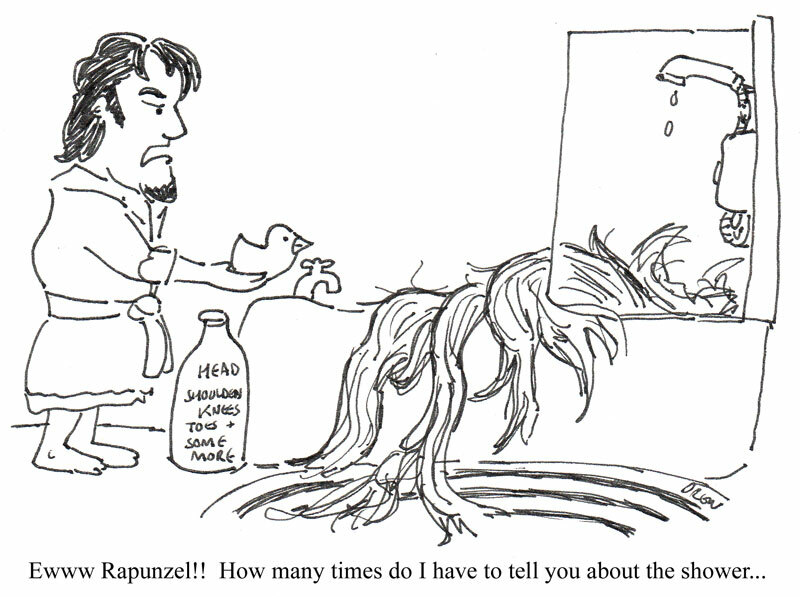 I titled today's cartoon 'Tangled Up In Loo' a musical pun (Bob Dylan) on Rapunzel in the bathroom. However there are two problems with that: firstly it's about a shower and secondly for an international blog I'm not sure how universal the term is. So this is my second Rapunzel/Tangled cartoon and this time it's based upon me actually going to see the movie with my daughter. It's a decent effort by Disney but I don't understand why Rapunzel doesn't spend the entire movie going 'Owww' given how much her hair gets tugged and how much my own offspring scream if you even take out a hair clip wrong never mind swing on their hair, beat up baddies or use it as a elevator. On the whole hair in the shower thing I'm quite cool with women having at least one foible otherwise they'd be perfect and my gender would have no comeback when we leave the loo seat up for the n-teenth time. Apple's iPad2 was unveiled tonight/today in San Francisco like the Second Coming for geeks. After days of hype saying it would be thinner, lighter, faster and make the user ten times smarter/attractive it turns out the iPad is thinner, lighter, faster and has a camera on both sides. 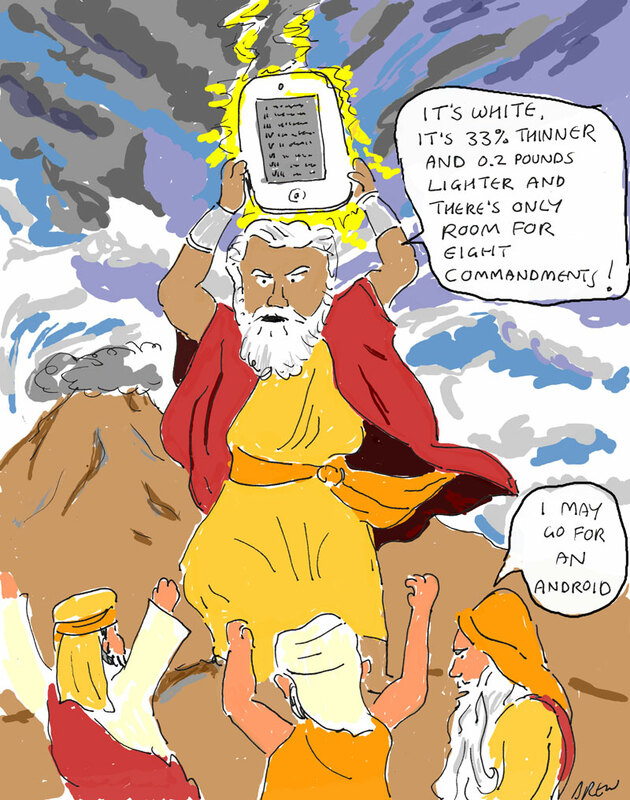 Of course the obvious gag here is the Moses Tablet vs Apple Tablet. Read your Bible or Wikipedia and you will see there was two sets of tablets the first one Moses smashed when he discovered the Israelites had got tired of waiting and had built themselves a Golden Calf/Android replacement. The second version wasn't smashed and was kept with the first set in the Ark of the Covenant. Had Apple designed the second tablet it would have been thinner, lighter with room for only 8 commandments. Apple would have insisted on keeping the commandments 'You Shalt Not Steal Music' and 'You will have no other Apps but Apples'. Then again we all know that Apple is not some sort of cult or religion whose devotees slavishly buy every new gadget they make. The European Union is a strange institution that started off as a European economic trading bloc, created butter lakes trying to subsidise farming and is now trying to regulate every aspect of our lives in it's ambition to turn Europe into a some version of Star Trek's Federation of Planets where everyone is equal and there isn't any money. The European Convention on Human Rights has had all sort of consequences like giving prisioners the right to vote. Simarly the European principal of gender equality has lead to a bizarre ruling by the European Court of Justice that insurers can't discriminate between men and woman. It's one thing to tell us we aren't allowed to yell at Women drivers any more and instead have to abuse all genders equally, but what is the reason behind ignoring statistical evidence that young men are far more dangerous on the roads than young women. Is this what feminists burned there bras for? The right to more expensive car insurance and pensions? At least meerkats will be happy. When you google their species the number one Google hit in the uk is a certain comparision website who trade on the fact their name sounds a bit like Meerkat. 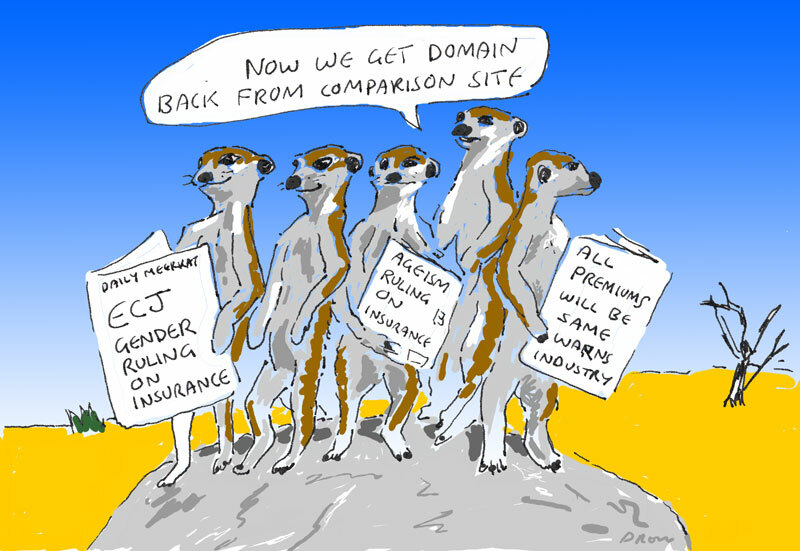 When the ECJ finally decides that you can't discriminate on gender, age, criminal record or ability then all insurance premiums will be equally expensive, there will be no need for comparision websites and the meerkats can have their domain back.